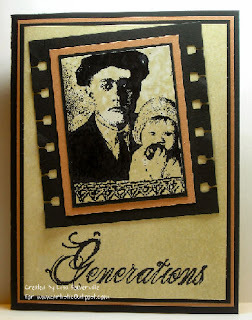 This was a fun card to make - it reminds me of the old box of family photos my grandmother had. For this card, I used the Ranger Spritz N Flick Technique. I used Ranger's Old Paper ink to cover my clay coated card stock, stamped my image in black archival ink and heat set. Then I lightly misted my stamped card stock with water and let it dry, creating the spots you see. To create the look of the filmstrip - I used my Spiral Punch. All stamps - Artistic Outpost - be sure to check out their sale!